Home / Stock Picks / Hot Stocks / Is Micron Technology, Inc. Heading for a Roadblock or a Breakout? Is Micron Technology, Inc. Heading for a Roadblock or a Breakout? 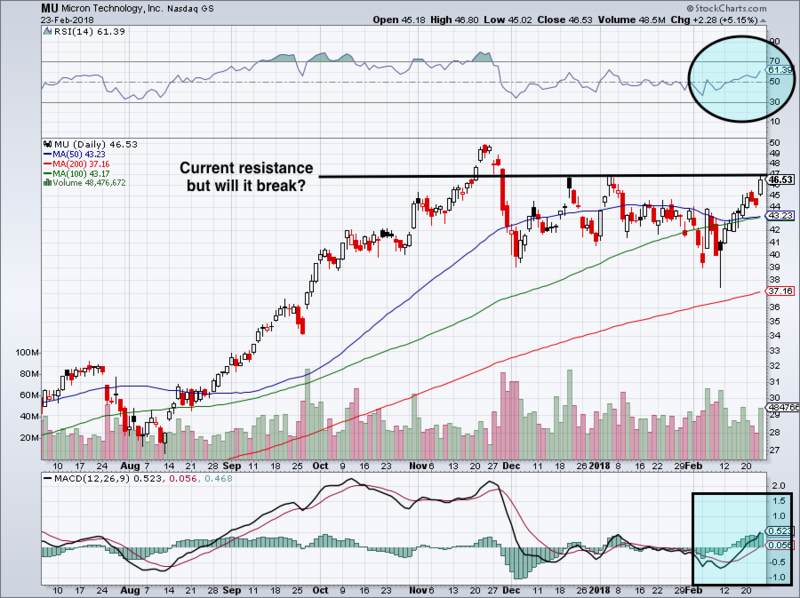 For those who have been bullish on Micron Technology, Inc. (NASDAQ:MU), Friday felt great. After a strong recovery from its deep losses in early February, Micron stock ended last week with an explosive 5.2% rally. Shares closed within pennies of its early January high, leaving many to wonder what’s next. Will the MU stock price run out of steam — again — or push to new highs? That’s the question we’re asking ourselves on Micron stock right now. Despite operating in a business where supply can quickly outpace demand and margins can sink, the valuation is simply too low. In the mid- to low-$40 range, MU was trading at about 4 times earnings, maybe even a little below that. How is that possible, despite a strong operating environment? We weren’t sure either, so we used the opportunity to get long. Right as the stock market was embarking on its rapid 10% decline in 10 days, management revised its guidance. If they had revised it lower — wow! — this stock would be in full-on tank mode. Yet, management gave a significant boost to guidance instead. That didn’t help too much when shares fell from $44 to an intraday low of $38 three days later. But for investors who were capable of thinking beyond the next few trading sessions, they knew they were getting a bargain. In its most recent earnings report in December, management said they expect revenue of $6.8 billion to $7.2 billion and earnings per share of $2.51 to $2.65 for next quarter. Both figures were vastly ahead of analysts’ expectations, which were looking for a laughable $6.21 billion in sales and $2.03 in earnings per share. Earlier this month though, management put out some good news. It now sees second-quarter revenue of $7.2 billion to $7.35 billion and earnings per share of $2.70 to $2.75. Analysts were only expecting sales of $7.02 billion and earnings of $2.57 per share. At this point, Micron stock trades at about 16 times second-quarter earnings. On a full-year basis, analysts are looking for earnings of $10.03 per share, more than double 2017’s results. For the record, three months ago analysts were only looking for earnings of $7.85 per share. Despite this significant increase in earnings expectations, shares are actually down slightly from 90 days ago. In any regard, Micron stock now trades at about 4.6 times this year’s earnings expectations. We know this valuation is low because of boom-bust concerns in the NAND and DRAM markets, but it’s simply too low in my opinion. One thing that gives me confidence in Micron stock has been other companies. Here’s what executives from Hewlett Packard Enterprise Co (NYSE:HPE), HP Inc (NYSE:HPQ) and Cisco Systems, Inc. (NASDAQ:CSCO) have said over the last few days, (bold emphasis added by me). “We continue to be negatively impacted by the higher memory pricing we have discussed over the past several calls which we expect to continue in the near term.” — Kelly A. Kramer, CFO at Cisco. “We continue to see some nominal increases in DRAM…So we factor in our plans the elevated DRAM for the remainder of the year.” — Antonio Neri CEO at HPE. “Broadly we know that DRAM is obviously a headwind…There may be some pressure from NAND.” — Dion J. Weisler, CEO at HPQ. “We saw industry-wide increases in component costs again in Q1, driven primarily by DRAM, which continued to put pressure on margins. We now expect to see increased component costs throughout FY 2018.” — Catherine A. Lesjak, CFO at HPQ. Micron’s management is telling us they expect higher prices and so too are the companies that buy its products. It’s a convincing story. However, the charts are less convincing. In my view, these recent comments along with the recovery in the broader market is propelling MU stock price higher. 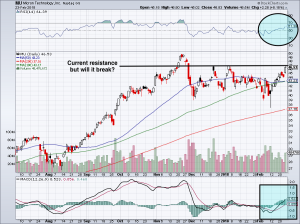 That’s great news, especially with Micron finally over the $45 range resistance level. In January, we nailed the stock’s impending resistance level near $47. While its recent rally higher has me optimistic, this level still looms large. If Micron stock can push through $47, odds of it hitting $50 increase dramatically. The stock is not overbought (blue circle) and has bullish momentum to boot (blue square). New buyers and current longs alike need to see how Micron stock handles $47. If it pushes through, look for $50 as the next target. If it fails, we want to see $44 to $45 hold as support. Bret Kenwell is the manager and author of Future Blue Chips and is on Twitter @BretKenwell. As of this writing, Bret Kenwell held a long position in MU. 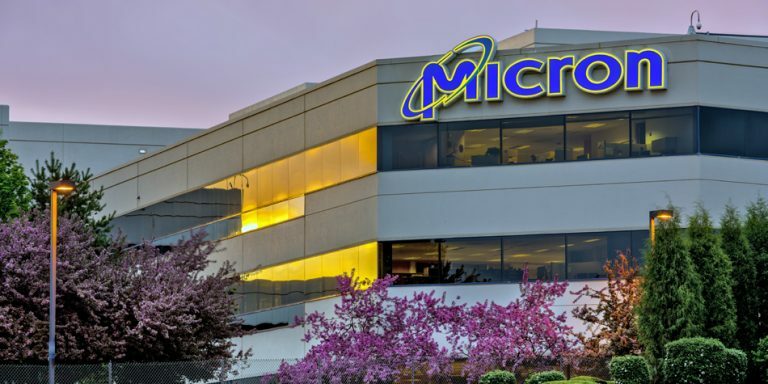 Article printed from InvestorPlace Media, https://investorplace.com/2018/02/trading-micron-technology-inc-mu-stock-new-highs/.